We are excited to expand our portfolio of Einstein Platform Services, enabling developers to create custom deep learning models from unstructured text and image data, such as customer emails, social media posts and meeting notes. Developers of any skill level can then easily embed these models into any custom app, empowering business users to harness these vast unstructured data sources to gain valuable customer insights and deliver meaningful, predictive experiences. 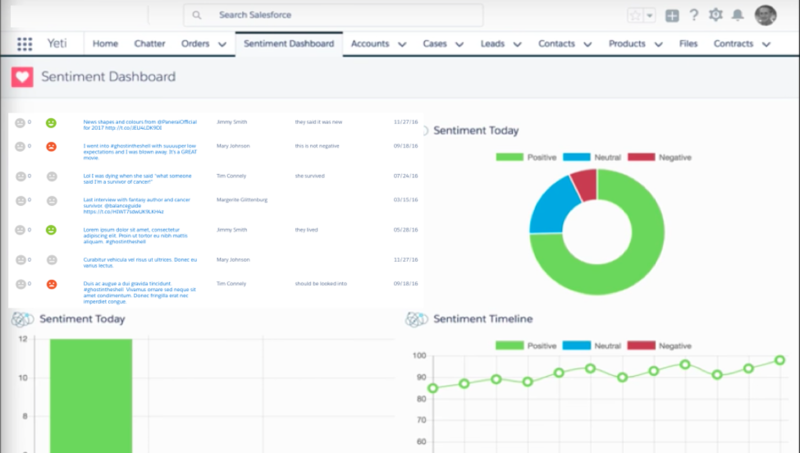 Einstein Sentiment which allows for text analysis of emails or social media content to determine the sentiment of the customer. Customers may use this data to determine whether or not customers are satisfied, or unsatisfied, with the level of service or quality of a product. Organizations can then use this information to escalate issues to supervisors or extend additional offerings to customers who have positive sentiment. Einstein Intent allows developers to build applications that will understand a user’s intent based upon the statements that they make. For example, if a lot of inbound customer inquires are based upon shipping problems, organizations can then detect that shipping processes are creating friction with customers and can fix those issues before they become worse. Einstein Object Detection enables organizations to train models that will recognize "multiple unique objects within a single image, as well as the location, size and quantities of those objects." An example of how organizations can leverage this service include a retailer who detects the stock of a particular product is low as a result of reduced inventory on the shelf. Using this insight, additional stock can be automatically ordered. Relationship Insights leverages the data-integration and artificial-intelligence capabilities built into Azure to combine and analyze your Dynamics 365 and Microsoft Outlook data. It uses the insights derived from this analysis to surface features that help guide your daily work, find critical opportunities, manage email communications, identify actionable email messages, and propose the best path forward. AI applications in CRM are just a tip of the iceberg. As AI technology strengthens, CRM which is ripe for disruption is going to be the biggest beneficiary moving from being a system of record to a really helpful tool helping organizations become more efficient and productive.